Let me set out a soapbox and make a case. It’s not one that I necessarily hold to all of but it stands up by itself when it’s made like this. One of the dangerous things about being genuinely interdisciplinary is that it means not just raiding other disciplines for ideas and running back to Clio’s Citadel to use them, but letting people from other disciplines inside your own to critique your methods and affectations and, in extreme cases, rearrange all your preconceptions in ways that feel inappropriate. In these terms, genuine interdisciplinarity is not just a challenge to one’s own thinking, which of course it should be, but a threat to the discipline. If anthropologists, archæologists, geneticists, mathematicians, ‘social physicists‘ and scientists in general start doing history, and they (as some are) are willing to learn enough history to make it count, purely text-based history stands to lose some of its legitimacy and identity. That said, as I was recently hearing argued at Leeds, it’s hard to know what we might call this endeavour of scientific elucidation of the past except, well, history, but the point is one of the people we train not being the people who can really do ground-breaking research but only those who guide people who actually understand the methods in use, while seeing their paradigms tested and discarded. This makes people defensive. I first noticed this with the reaction to Heinrich Härke’s work on skeletons and the settlement of Anglo-Saxon England. He detected two different builds of skeleton in several sites on which he’d worked, and argued that they could be identified as ‘British’ and ‘Germanic’.1 There were all kinds of reasons to mistrust that analysis when it was made: the biggest and most obvious one was that the discipline had spent a decade or so emphasising that ethnogenesis made concepts of ethnicity and race fluid and basically unfounded in biological reality, and then here came this archæologist who apparently hadn’t got the memo and was stressing just those realities. (I suspect it’s also possible that people were slightly uncomfortable with a German scholar laying heavy emphasis on race, which sounds old-fashioned in a range of ways not all of which have been harmless. I doubt an English scholar would have provoked the same reaction as Härke did. And no, I don’t think that’s how it should be.) But although his interpretation can be questioned in lots of ways, the data were real: he had two different sorts of skeleton to explain. Now, of course, we would try and carry out isotope analysis of the bodies’ teeth to see where they had actually lived in their lives, but that’s not exactly history rescuing itself; that’s either history using science, or else it’s science colonising history. And the same sort of battle is ongoing with the increasing rôle of DNA analysis, confused by the fact that very few people understand exactly what studies like Blood of the Vikings actually showed, and these people very rarely include journalists; I have a sketchy idea but only because I like talking to scientists and Steve Harding at Nottingham is very happy to talk to people. You see what I mean. Texts are safe, because we can never finally resolve them but we can be expert in them all the same. But the empirical demands of history, when it’s allowed to assert them by its practitioners, draw us to empirical evidence, and the ways to derive empirical evidence from archæogical remains, and indeed buildings, objects and yes, texts, or at least, writing, from non-archæogical contexts, are growing. But they’re complicated, and they’re going to involve laboratories. There is coming a point when those who want to identify as historians are either going to have study a lot of science, or back out and work only on literature. Now I know that some readers quarrel with my distinction between reading as literature and reading as historical source, but let them click the link I’m lengthily touting before they make answer. This is it: here is one historian, Michael McCormick at Harvard no less, who has already decided where he stands, and it’s with the scientists. And as a result all that ethnogenesis work and elaborate explanations of the Celtic assimilation into English society are looking rather bare: but because actual historians were involved, and deeply, and the team seems to like the exchange of ideas, what we are getting is not a return to the old paradigm of fire and slaughter or even mass enslavement of Britons by Saxons but a new idea that there must have been some very distinct preferential marriage practices of which we previously had no idea. Yes, they are proving things about marriage practice in the early Middle Ages using science. We can work with this, if we actually want to discover what happened that is. Or we can complicate it and resist it. So, brothers and sisters, the time has come for each and every one of you to decide whether you are gonna be the problem, or whether you are gonna be the solution! Are you ready to testify? 1. Härke’s work e. g. Heinrich Härke, “‘Warrior Graves’? The background of the Anglo-Saxon weapon burial rite” in Past and Present no. 126 (Oxford 1990), pp. 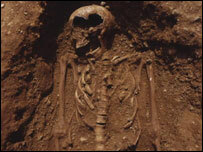 22-43; idem, “Finding Britons in Anglo-Saxon Graves” in British Archaeology no. 10 (London 1995), p. 7, online here. A measured critique in Andrew Tyrell, “Corpus Saxonum: early medieval bodies and corporeal identity” in William O. Frazer & Andrew Tyrell (edd. ), Social Identity in Early Medieval Britain (London 2000), pp. 137-156. Härke responds to his critics, some of whom were less measured, in Heinrich Härke, “Archaeologists and Migration: a problem of attitude?” in Current Anthropology Vol. 39 (Chicago 1998), pp. 19-35, on Scribd here, and has now gone to work on similar themes on Russia where I suspect he meets fewer problems. This entry was posted in Anglo-Saxons, archaeology, Celts and tagged burial archaeology, Heinrich Härke, interdisciplinary conversation, J. C. Crawford, Michael McCormick, science!, Steve Harding. Bookmark the permalink. I posted on that McCormick piece a while back; found it fascinating, though the title was really off, wasn’t it? Indeed! A real case of headline journalism there. There are similar findings in South America. Lots of men with European Y chromosomes and Native American mtDNA. The Native American Y chromosomes almost became extinct, surviving only in a few small enclaves. Mitochondrial DNA (mtDNA) is passed through the mother’s line only. People don’t like to use this type of information because its so politically incorrect… not that the past was often politically correct. Btw, slavery is a good way of keeping native men from reproducing. All migrations led by at least a military advance wave will wind up taking native ‘wives’. Very few European women migrated to South America, and yet European female artifacts and lifestyle certainly came to South America. Anyway, the first couple generations of migrant-native children will have a disproportionately large impact on the population. Their children will be greatly advantage over all native children, and those migrant-native children will likely identify with the migrant ethnicity if it does bring them advantage. One of the other reasons, of course, that the Anglo-Saxons supposedly can’t have driven out all the wealhas with Fire and The Sword is that they must have had some kind of labour force. I think we do have to retain the ability to envisage slavery there. Though not in all areas! as you know Northumbria shows signs of being a very different deal in most places, at least ethnically; I’m not saying they didn’t have slaves, just that they probably weren’t as close to all being British. I think there was plenty of slave taking in the North on all sides. It may just be that the ‘English’ were less English than elsewhere. I remember reading somewhere that slaves must have been a primary revenue source for the Northumbrian kings – probably selling to foreign markets. Another way to get rid of native males is to sell them as slaves to foreign traders. I’m not sure I buy the idea of slave-taking for the market, I have to admit. Surely, if you’re an early medieval king, your main expenditure of revenue is on retaining followers. Why on earth do you exchange slaves, which are already wealth, for currency or other goods, when you could just hand them out? Your political exile idea makes sense for a few cases; but not for a whole people, surely. I think I can envisage slave-traders making deals with people after a battle, though, if only because of Bede’s Frisians who seem to have been doing just that. I just can’t imagine that was where most of the prisoners wound up. Ahh… but think of Queen Balthild… surely a high status slave. If making followers happy were a king’s only concern, then surely giving her to one his followers would have been better than a few coins. There is an advantage to shipping members of rebellious or deposed families away. The same would be true of British families. Well, I guess it might also be quite a policy goal to keep the Merovingians happy :-) I would have said that shipping deposed royals away is asking for trouble, myself: think how many we could name who come back, albeit not from slavery (but, the winner’s history would hardly mention that, would it…). Quite an appropriate piece of music to go out on! It strikes me that if text-based historians don’t want to be continually snookered (and out-funded) by lab-based historians, they are gonna hafta learn some MATH! Anyone hear read Willis’ THE DOOMSDAY BOOK where mid-21st century historians are all time travellers to whom it never occurs to consult a text, even for 14th century England? I have to apologise again for WordPress’s continuing conviction that your comments are spam, by the way. I don’t know what it’s profiling on and there is no way of white-listing things as far as I know. It doesn’t catch all your comments but some I have to rescue from the bin. I shall try and raise this with their support. Oh, and the music chosen to go with the final quotes, of course :-) If I could have found any video of Crawford’s address I would have used that, but Warner Bros appear to have chased it off Youtube. I think there are two problems with this post, at the specific and the general level. Firstly, there’s the specific paper that McCormick is referring to, which seems to be Mark G. Thomas, Michael P.H. Stumpf and Heinrich Härke, ‘Evidence for an apartheid-like social structure in Anglo-Saxon England’, Proc Royal Society B October 22 2006 vol. 273 no. 1601 2651-2657, full text available online. At a quick look I see several problems with it. 1)Its mathematical model seems to me to be using dubious parameters. (A mathematical model obeys the same rule of GIGO (Garbage in, Garbage out) as a program). In particular, they seem to be assuming that the selective advantage for being in the more favoured class is at least double (that they will have twice as many children), based on a few sets of data from very different periods. It’s only by assuming that extraordinarily large advantage that they can get the results they want in a realistic timeframe. 2) They’re assuming a uniform pre-invasion population, whereas there are now suggestions of substantial regional genetic variation in Britain already existing in the Neolithic/Iron Age periods . There’s a more recent paper in Proc Royal Soc B (not free, unfortunately), that seems to be arguing this. 3)I’m also not sure (because I don’t know enough demography/genetics) whether their results would still hold if there was a generation or two of intermarriage before any ‘apartheid’ was applied, which is likely, unless Anglo-Saxon women came with the initial incursions. What worries me more generally is that at one point in your post you say ‘they are proving things about marriage practice in the early Middle Ages using science’. No. This is a hypothesis by one group of scientists which may well not stand up to test by other scientists. After all, this paper comes only four years after one in which the same Mark Thomas was arguing for mass migration by the Anglo-Saxons. He changed his mind because his earlier argument obviously didn’t stand up. So I think that setting this up as for the scientists or against them is far too simplistic. When there is a scientific consensus on an issue, I think we should be paying very careful attention and incorporating their work into our historical theories. Where there isn’t (and there isn’t on historical population genetics yet), unless you are sure that you know enough about demographics and statistics/mathematical modeling to decide between two competing theories, I would be pretty careful about picking a view based on the ‘science’. History may be damaged by looking too old-fashioned and ignoring material evidence, but it will also suffer from jumping on and falling off too many ephemeral scientific bandwagons. Well, it was as said at the beginning a polemical piece rather than a credo so I’m glad to see someone picking holes in it. I agree that the choice of the word `proven’ was a poor one and I may go back and change it. If so I will say so here. Thankyou for digging up the Pattison article too. But have you read it? And then have you followed it back to the 2003 article where his ‘data’ is coming from? The population curve he is basing his work on is not derived from genetics or science at all, but an estimate based on such top-class historical work as John Morris’s The Age of Arthur, a Fontana History of Britain paperback and some slightly better-founded early modern work. Apparently apart from, well, the Black Death, it “clearly represents the general trend of the population of Britain over the past two millennia”. And this is where his graphs in the 2007 paper and his estimates of levels of indigenous survival are coming from, i. e. guesses based on guesses based on extrapolation. I don’t have to be able to follow his maths to know this is rubbish. I don’t know if we could tell, but that would make the subsequent few thousand years’ history rather difficult to explain, don’t you think? I haven’t actually been able to look at the Pattison article yet – I don’t seem to be able to get access off-campus, so it was probably rash of me to cite it. I was presuming (wrongly) that it was a variant of the argument that Stephen Oppenheimer was making in ‘Origins of the British’ (which I have skimmed through). This is essentially that the west/east genetic split in Y chromosones in the British Isles dates back to the Stone Age, when Britain was repopulated via two different routes: one up the Atlantic coast and one from Continental Europe. Invaders in the early Middle Ages didn’t actually alter this genetic pattern much, they just slightly reinforced the Germanic side. (He also then interlocks this with arguments about Celtic languages, plus Barry Cunliffe on the archaeology of the Atlantic fringe, but I don’t think these bits are essential to the genetic argument). This is where I rapidly reach the outer limits of my knowledge and beyond. I can vaguely believe an argument that very long-term survival of Y chromosones in a particular region is possible, if you assume virilocality, because in that case, Y chromosones only change region when actual men change region. But I don’t have any clearer sense of whether this is genetically or socially actually plausible, because I know sod all about prehistory. But I think another problem with both variants of the Thomas hypothesis is that they don’t give a good fit to the data from another big study, Christian Capelli, et al, ‘A Y Chromosome Census of the British Isles’, Current Biology, Vol. 13, 979–984, May 27, 2003 (on Science Direct. That had places in southern England (such as Faversham in Kent and Midhurst in Sussex) looking less German/Danish and more like Ireland/Basques than places in the Midlands. The South Saxons not being terribly ‘Saxon’ seems a big problem for any view that the traditional Anglo-Saxon invasions had a big influence on genetic make-up, whether by mass replacement or out- breeding the natives. One thing that does occur to me is that, were we looking for a historical way to explain the Oppenheimer thesis as Wikipedia reports it, we would be back to large numbers of Roman auxiliaries settling in the country during the second to fourth centuries as the easiest explanation, wouldn’t we? And then the invasion, however big, supposedly happening on top of that, but presumably not in any kind of cooperation, which would explain the general lack of continuity between sites with early Saxon material and stuff even earlier than that. The view that the English are not derived from continental mass migration doesn’t really hold much water. Firstly illiterate ”barbarians” like the Anglo-Saxons could not have spread their language to a population larger than themselve. Thye had no adequate schools for doing so and they certainly had a major lack of scholars. It is more lilkely that the Anglo-Saxon royals are more ”Britonic” (or Basque according to Oppenheimer the paediatrician) than the Anglo-Saxon peasants as some of them would be able to read and write to an extant and may be descended from Germanic warriors in service of Rome. Also Celtic, Brythonic and otherwise, loanwords are very few in the English language. If the hypothesis that the English are mainly derived from the British is correct then the language would still have more loans from Brythonic than we actually do. There are Brythonic topographical names in use, however, most of them have no semantic continuity from Brythonic; case in point ”Avon” is derived from a word that simply means river but was used by the English as a personal name for many rivers. Ouse, another river, comes from a word that simply meant water and Trent comes from a Brythonic word for a ‘trepasser” (an over-flowing river). Also when the Anglo-Saxon migration is weighed against the continental migrations and the later invasions of England, the argument still does not hold water. For example the Lombardic migration into Italy was rather large for the time, however, the Lombards didn’t manage to change the language of Italy into a Germanic language. The Gothic invasions, the Vandal invasions and the Frankish invasions did not change the language of the population in the areas in which they invaded either. The later Norman invasion didn’t change the language of England into French even though the Normans were literate and had adequate schooling. None of these points have been successfully explained by proponents of this ridiculous theory and they never will be able to explain them. The idea of Britonic or Basque survival is more rooted in British nationalism than real scholarship. English proponents of British nationalism shudder at the fact that the English are an immigrant people. They would to be unique and seperate from the continent. Firstly illiterate ”barbarians” like the Anglo-Saxons could not have spread their language to a population larger than themselve. Thye had no adequate schools for doing so and they certainly had a major lack of scholars. But does one require schools and scholars to learn a language? Surely not, or we would never be able to acquire the languages of those without schools themselves. Also Celtic, Brythonic and otherwise, loanwords are very few in the English language. And yet more may be recognised as the possibility is more fully investigated: see L. Todd, “Where have all the Celtic words gone?” in English Today, vol. 16 no. 63 (Cambridge 2000), pp. 6-10. The Gothic invasions, the Vandal invasions and the Frankish invasions did not change the language of the population in the areas in which they invaded either. None of these points have been successfully explained by proponents of this ridiculous theory and they never will be able to explain them. how do you explain those cases where macro-scale language change after conquest has occurred? The idea of Britonic or Basque survival is more rooted in British nationalism than real scholarship. English proponents of British nationalism shudder at the fact that the English are an immigrant people. But these views are, thankfully, not those of the majority of the population, and certainly not the scholarship. Do have another turn, though!